Where to buy Zantedeschia albomaculata plants & price comparison. 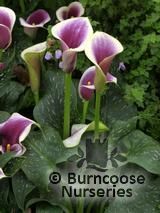 Photos of Zantedeschia albomaculata plants in real gardens. Clicking on any of these plants will give you more information, you only leave this website if you decide to buy. You can see all the Zantedeschia plants and Zantedeschia seeds and bulbs for sale in our garden centre which lists products from over 25 popular websites. You can also discover who's growing Zantedeschia albomaculata. This advice is from our members, if you can't find your question, please try the Zantedeschia genus page or ask our friendly community.